E turned 29 last week! We trekked all the way to Jersey and surprised him with go karting. There were lots of taking over, bumping and bruises involved. After a serious aggression-fest, it was time for all-you-can-eat hotpot and tacky chinese birthday songs. So in other words, this birthday surprise was a very solid 12 out of 10 and E is still talking about upping his average go karting speed this week. Oh, and there was cake! This cake is one of the coolest cakes i’ve learnt in pastry school so far. Essentially it’s a roll cake, but vertical! Our instructor says it's one of those cakes with a 100% wow factor and it’s so true! Wait as you cut and reveal the first slice because this cake has straight stripes that makes everyone go "ooh" and "aaah" and “how do you make that?” It's the best surprise cake ever, even better than the ones with candies exploding from the center or the ones with baked-in patterns. Strawberry and pistachio is such a perfect combo! if you have the time, I highly recommend making your own strawberry purée and pistachio paste. It’s easy and a lot cheaper than what you can get store-bought. Also, you can adjust the sweetness and type of sweetener, which is always preferred! For this recipe, i used a nutty buckwheat honey to sweeten my purée. Store bought pistachio paste usually has a bit of almond extract to bring out the flavour of pistachio. if you are making your own, add a drop of two of that too. For cakes with multiple flavours, I like to mix up the type of fillings, like this creme mousseline and Italian meringue buttercream combo. Creme Mousseline is also known as german buttercream, a lighter buttercream made with pastry cream and butter. Sub out the milk for fruit puree and you can easily make a fruity pastry cream without dairy. The strawberry here produces a beautiful pink colour which I amped up with some freeze dried strawberry powder. The pastel green Italian buttercream is more sturdy and stable, a perfect candidate for masking. The beauty of this cake is how flexible it is. You can trim the joconde to the height you want, and keep rolling until you get to the desired diameter. The buttercream recipes make more than you'll need, exactly for this reason. If you want a taller or larger cake, simply double the joconde recipe! Makes one 3" tall 9" round cake. Adapted from ICC. Preheat the oven to 375F. Grease and line a full sheet pan with parchment paper. Set aside. Sift together the pistachio flour, almond flour, pastry flour, and powdered sugar. In the bowl of a mixer fitted with a paddle attachment. Add the egg yolks and eggs and paddle until light and fluffy. In another mixing bowl, whisk the egg whites and cream of tartar until foamy. Gradually add the sugar a little at a time, until soft peaks form. Continue whipping until stiff peaks. Fold the meringue into the nut mixture in three additions. Spread the batter into the prepared sheet pan with an offset spatula. Lightly dust with powdered sugar and bake for 10-12 minutes, or until spongy to the touch and evenly browned. Remove joconde from the oven and allow to cool completely before unmolding. To make ahead, wrap and refrigerate joconde for up to 1 week, or freeze for up to 2 months for longer storage. Combine the fruit purée with half of the sugar in a saucepan and bring to a boil. Whisk together eggs, egg yolks, remaining sugar, salt, and pastry cream powder until smooth and free of lumps. Temper the eggs. When the purée comes to a boil, pour about a third of the hot liquid into the egg mixture and whisk vigorously until combined. This is called tempering where you're trying to bring two mixture's temperature closer to each other. Add the tempered egg mixture back to the pot with the rest of the fruit purée and bring the mixture to a boil, stirring constantly for about 2 minutes, until thickened. Remove the mixture from the heat and spread it out onto a plastic wrap-lined sheet pan. Cover the crème mousseline with plastic wrap to avoid forming a skin. Allow it to cool to room temperature. Place the crème mousseline in the bowl of a stand mixer fitted with a paddle attachment, and paddle until smooth and free of lumps. Meanwhile, wrap the butter in plastic wrap and slightly knead until malleable but not melted. Gradually add the butter in small pieces and paddle until it is completely incorporated and the mixture is light and fluffy. Use immediately or cover and refrigerate. If making ahead, crème mousseline can be refrigerated for up to 7 days or frozen for up to 2 months. Refresh by paddling until it is light and fluffy before using. Make a syrup. Combine 250g sugar and water in a saucepan, making sure all the sugar is wet. Cook the sugar to the soft-ball stage (235-240°F). Do not stir. If there are any sugar crystalizing on the side of the pot, you may use a wet brush to dissolve it. When the sugar has reached soft-ball stage, pour the hot syrup down the edge of the bowl, with the mixer running at medium high speed, in a thin and steady stream. Do not pour it onto the whisk or it may splatter. Continue to let the meringue beat, at medium speed, until the bowl is cool to the touch. Change to the paddle attachment before adding the butter. Wrap the butter in plastic wrap and slightly knead until malleable but not melted. Slowly add the butter to the meringue and beat until the butter is smooth and incorporated. Fold in the softened pistachio paste into the buttercream with a spatula. Use immediately or refrigerate for up to 1 week or freeze for up to 2 months. Trim the edges of the joconde so you have a rectangle with straight corners. Cut lengthwise into 4 strips, around 3" wide each. 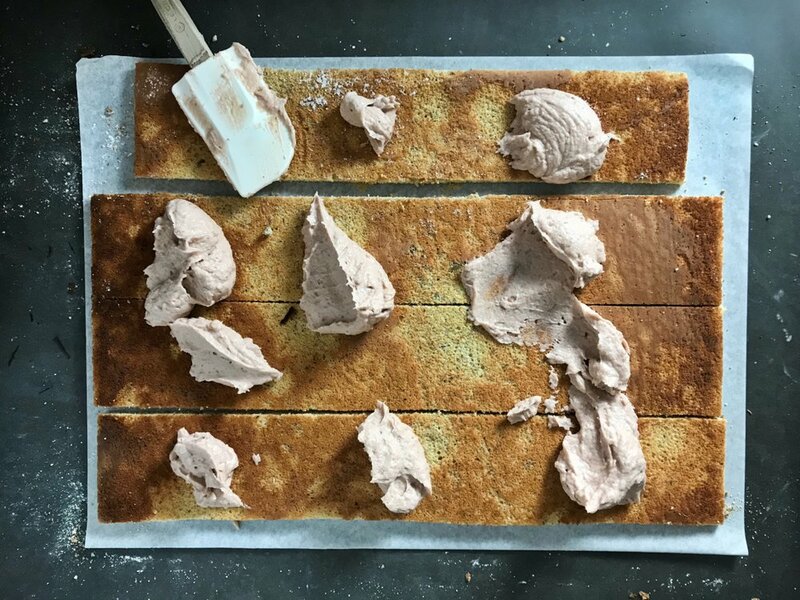 Spread half a cup of strawberry mousseline onto each strip of joconde with an offset spatula. Make sure the mousseline layer is not too thick so it doesn't squeeze out as you roll. Starting from the short side of one of the strips, roll the joconde tightly. Once you have one roll, hold it over the end of another strip so the ends meet. Continue rolling to make a bigger cake roll and repeat with the rest of the strips. Don't worry if the cake starts to crack, simply patch it together with some buttercream. If the cake roll gets too finicky to handle, place it vertically on a card board and carefully fit the cake strips on. Place the swirl side on a 6" cake board. Chill in the refrigerator for 15-20 minutes. Before you mask, make sure the pistachio buttercream is refreshed and at the consistency of mayonnaise. Crumb coat the cake and chill for 15 minutes. Mask with more pistachio buttercream, smoothing out the top and sides with a straight spatula or a bench scraper. Decorate the tops with crumbled freeze dried strawberries. Chill for at least one hour. To serve, allow the cake to sit at room temperature for 20-30 minutes, or until the buttercream slightly softens. No one likes to eat cold and icy buttercream!